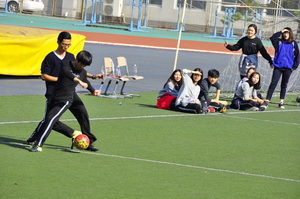 Three days on October 22, 23,26,2015,our international student union held our first league soccer match on thecampus field and got a successful conclusion. The student union was sponsor ofthe match and soccer playing organization as assistance. Their original goal isto keep the adage of strengthen physical exercise for all members, make contactwith Chinese and foreign students, fell away the stressful atmosphere and promote the soccerspirit. The match was met with enthusiasm of Grade 10,11 and exchangestudents. Thewhole match was divided into 6 games, played by 4 teams in doubles, and wasusing the scoring system. 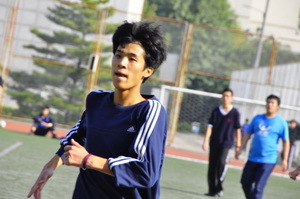 The Chinese 10th grader’s team, team “DawnFC”, got 7 points after 3 games and therefore won the first prize. TheInternational 11th graders’ team “The Nameless Top 100”, won thesecond prize for their disadvantage in goal difference. The Chinese 11thgraders’ team, “Supreme” and the International 10th graders’ team,“TSL”, won the Best Cooperation Prize and the Best Organization Prize,respectively. Their extraordinary team spirit is a vital part of the match. Outstanding player is another noticeable point in theprocession, especially Minggui Piao from class11-C2, he played a important rolein his team, his action make a real achievement that he got the best player ofshooting. It is inseparable for whatstudent union has contributed to the match, their caring attention and supportwas always present. We should also be thankful for participation ofteacher Xi Cheng, Baiqiang Zhang, Lei Xu and Yan Wang. Their participation addglory to the competition, we understood equality andpromote peaceful relationship among teachers and students while sweat-soakedmatch. Cease toexercise and you cease to live. 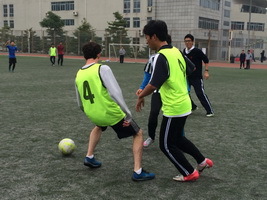 In this match, students from our internationaldepartment realized their valuable team cooperation and released the passionand vitality of youth. The match was a new start as well as a new beginning. Itencouraged our international department student union to hold more beneficialand interesting activities, in order to enrich our extracurricular life andflourish our campus stage. We are facing the sun. We are in our prime.